I am not into extravagant cooking and lavish and elaborate spreads. Easy, simple, quick cooking is my forte and I love experimenting in that zone. And why not, with all the running around that we guys do, everyone needs a quick solution to their meals. And, if you will add the element of a healthy diet in it, then bang on! You have cooked the right food for yourself. 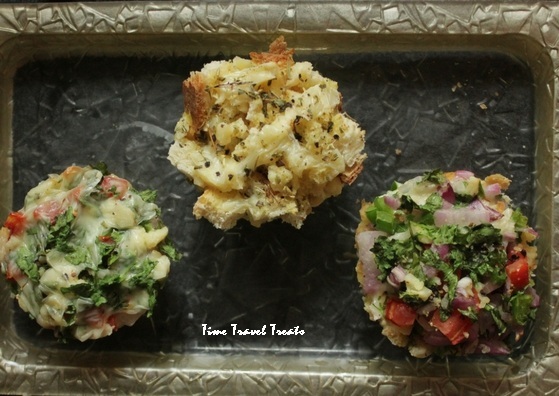 And likewise, I also happened to make these ultimate Savoury Muffins in three different flavours to give you not only varied pallets of taste but healthy and quick meal solutions. The idea of savoury muffin stuck when I was organising my baking tools and I found out my small cute little silicon muffin moulds. Well, a lot of sweet baking was already on the go so I was kind of reluctant to cook anything sugar coated, so I thought of doing the reverse of it. And hence the savoury quotient in muffins came into the picture. And believe me, I am so happy with these muffins that I am surely going to play around with them more. I made these savoury muffins on Monday morning which are usually the busiest mornings of all days. Husband was ready to leave for work and I really needed to quickly pop them into my oven. So making the batter and assembling stuffing and prepping dressings was absolutely out of question. I dug my nose deep into my fridge to get the quick and easy solution to all these troubles and Voila! I was able to serve not only one but three different utterly delicious and healthy muffins on the breakfast table in no time. I am sure you must be thinking that why three if I could have easily got away with one option. So my friends, let me reveal that all the fillings were made with the absolute same preparation. Yes, you do not even have to make different fillings for these muffins. 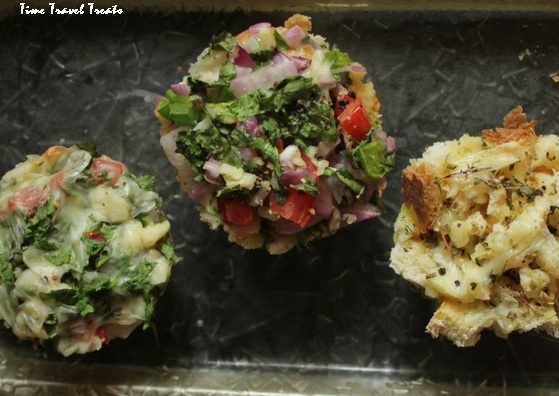 All I did was, changed few herbs, to give them their distinct flavour and made this three style savoury muffins. So without much ado, let’s dig into the recipe. I will try to make it stepwise for your convenience and to reduce any extra effort. All the ingredients are for single helpings i.e one muffin each. You can increase the proportion as required. Ready to use pasta sauce. If you wish, you can make it at home a night before. Recipe of my go-to pasta sauce is at the footnote on this post. Grease your muffin tray or your muffin moulds with butter and keep aside. Break both eggs and whisk them thoroughly, add milk to it and add little salt and pepper. Keep this mixture aside. Cut all three vegetables into small pieces and add salt and pepper. Divide them into two equal portions for Italian and Indian version muffins. Tear your bread into small pieces. Divide them into three sections. Italian Savoury Muffin – In your muffin mould, spread few crumbs of bread. Top it with pasta sauce and cheese. Now add few chopped vegetables and again top it with cheese. Sprinkle oregano and chilli flakes on top of it. Pour the 2-3 tbsp of egg mixture into the mould till it soaks all the ingredients. 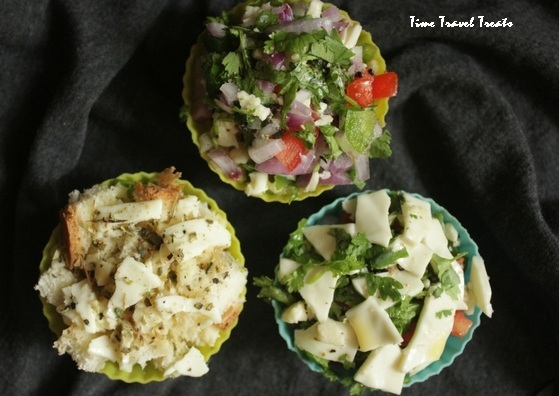 Indian Masala Muffin – Add some bread crumbs in a muffin mould. In the second batch of vegetables add the masalas and chopped coriander and mix well. Add it in your muffin mould and pour 2-3 tbsp of the egg mixture. Top it with chopped coriander for garnish. 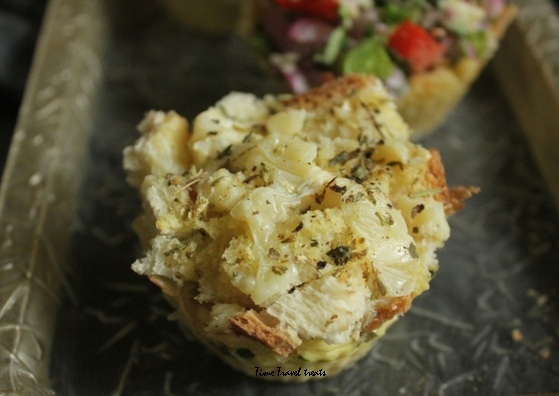 Dried herbs and Cheese Muffin – In the last batch of bread crumbs, add dried herbs and cheese. Put it in your muffin mould and pour 3-4 tbsp of the egg mixture. Top it with cheese and more dried herbs. Pick your muffin tray/ mould and put it into the microwave in the micro mode for 1 minute. Insert the toothpick and check if it comes out clean else give another round of 30 seconds for the eggs to cook properly. I did it in micro mode since I was in a hurry, you can bake them at 180 degrees for 15-20 min. Make sure you preheat your oven beforehand. 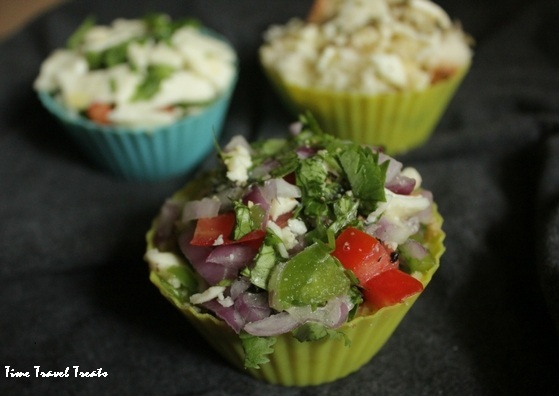 So here you have my friends, the easiest and quick savoury muffins recipe. I tried these three flavours, you can mix match and try your own choices and make several others. But in that case, don’t forget to share them with me and I will love to have that as a host post on this blog. Can’t wait to have your comments on how you liked this recipe and if at all you will try them, do share your experience. My go to Pasta Sauce Recipe – Just blanch 2 tomatoes in the pan and remove skin. Cut then in small pieces. In a sauce pan, add 2tsp butter or olive oil. Add 3-4 minced garlic cloves and add in your tomatoes. Sprinkle salt, pepper and pasta seasonings. Your quick and easy pasta sauce is ready to store.